Earlier this December Kernl launched a closed beta of our WordPress load testing service. As part of that beta we’ve decided to run a series of load tests against some of the common managed WordPress hosting services. GoDaddy has been around for ages. They are fairly inexpensive for the service that they are offering. How will providers be judged? The Small Test – 200 users, for 10 minutes, ramping up at a rate of 2 users per second. We did this test to check our configuration before we ran more intense load tests. The Sustained Traffic Test – 2000 users, for 2 hours, ramping up at a rate of 2 users per second. 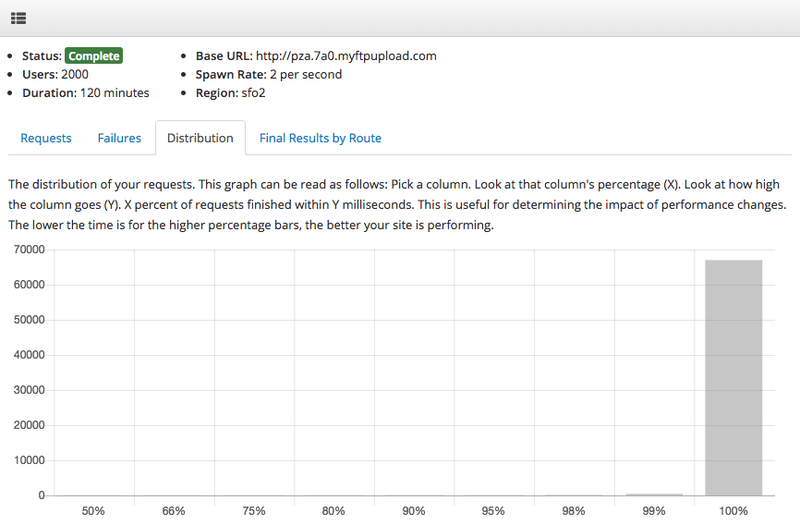 This test was performed to see how GoDaddy’s WordPress hosting would perform under a sustained heavy load. The Traffic Spike Test – 20000 users, for 1 hour, ramping up at a rate of 10 users per second. This test was used to determine how GoDaddy would handle lots of traffic coming in at once versus the slower ramp up of the sustained traffic test. There was no configuration or tweaking done on the GoDaddy WordPress install. We simply imported the content of http://www.re-cycledair.com and started testing. 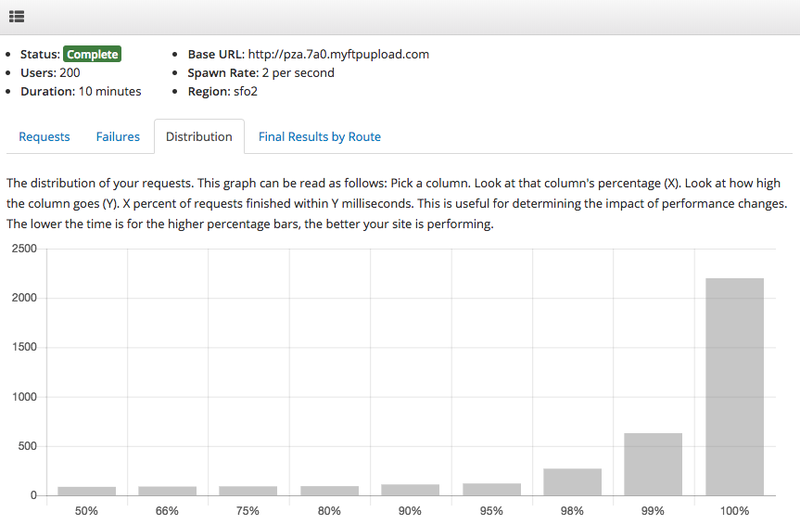 An important part of this load test was which GoDaddy WordPress hosting plan was selected. As we’re going to try and do this across multiple different providers we’ve opted to go for plans based roughly on price. 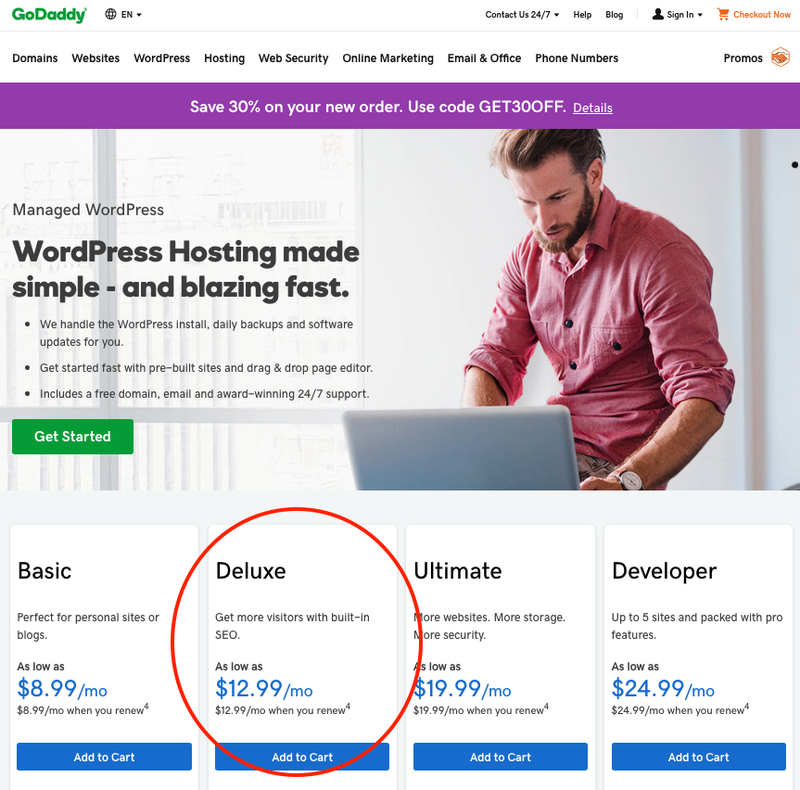 This plan was the “Deluxe Managed WordPress” plan that costs $12.99 / month. For these three load tests we generated traffic out of Digital Ocean’s SFO2 (San Francisco, CA, United States) data center. 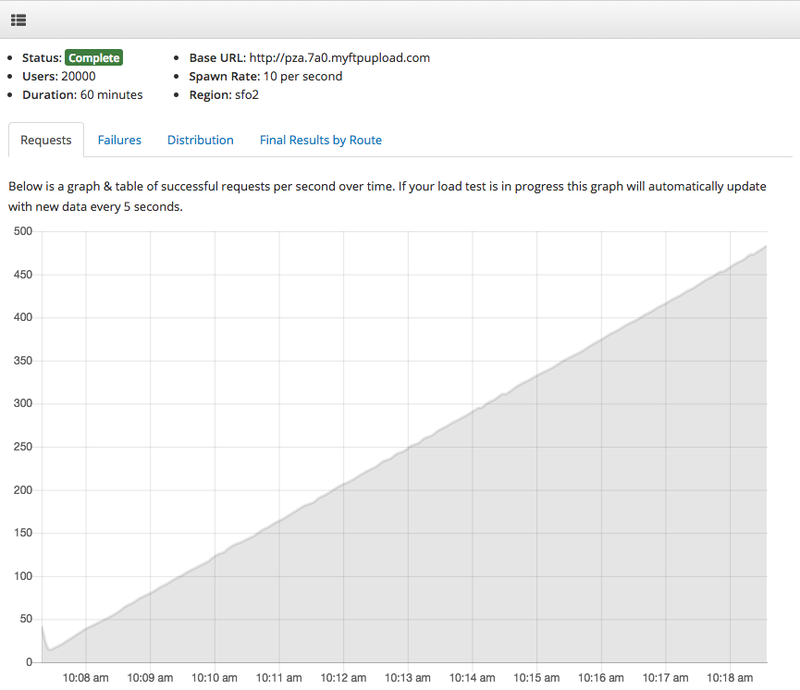 The requests graph represents the number of requests per second that the site under load is serving successfully. From the graph below, you can see that GoDaddy had no problem serving 200 concurrent users. After the ramp up completed things settled in at around 25 requests / second. 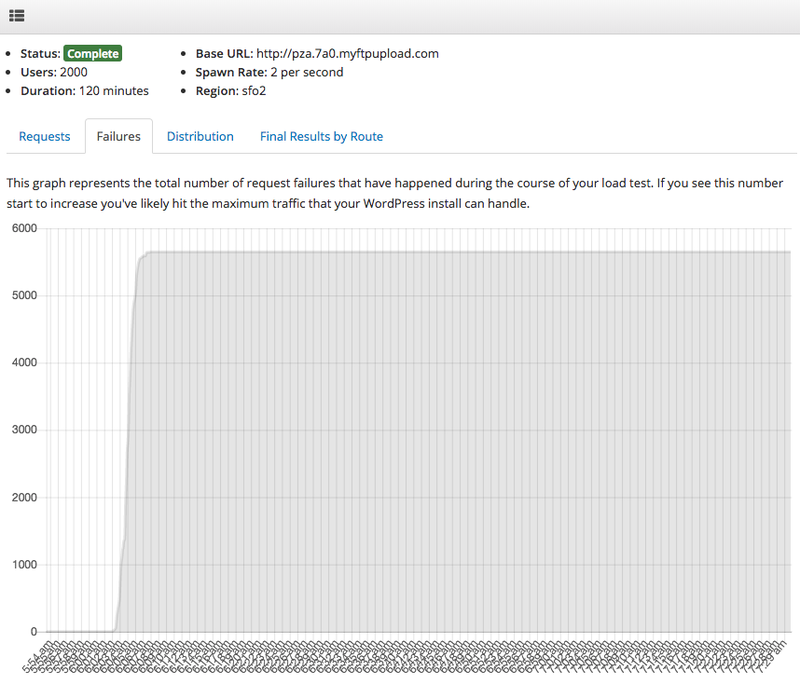 The failure graph shows that during this load test there weren’t any reported failures. The final graph of the 200 concurrent user small test is the distribution graph. This is probably the most important part of these tests because it helps you understand what your end user experience will be like when your site is under heavy load. To understand the graph select a column. We’ll look at the 99% column. Now read the value of the column (~600ms). 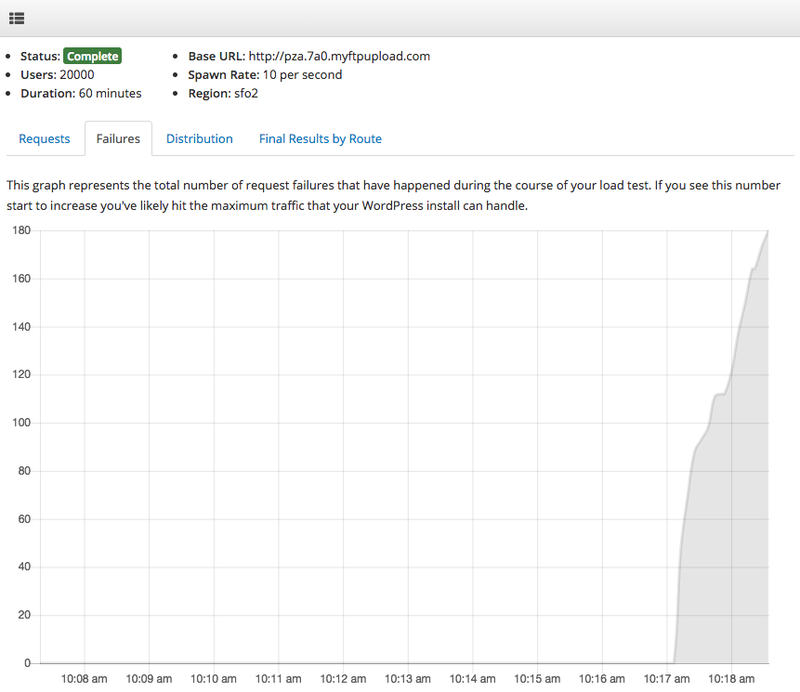 You can now say that for this load test 99% of all requests finished in under 600ms. If you look at the 95% column you can see that the results are ~200ms which is pretty fantastic. The 100% column is almost always an outlier, but even in this case having 1% of requests finish between 500ms – 2200ms seems ok. The requests graph for the sustained traffic test yielded a nice curve. The traffic ended up leveling out at 252 requests / second. The transition along the curve was smooth and there weren’t any obvious pain points for request throughput during the test. The failure graph for this set of tests is particularly interesting. 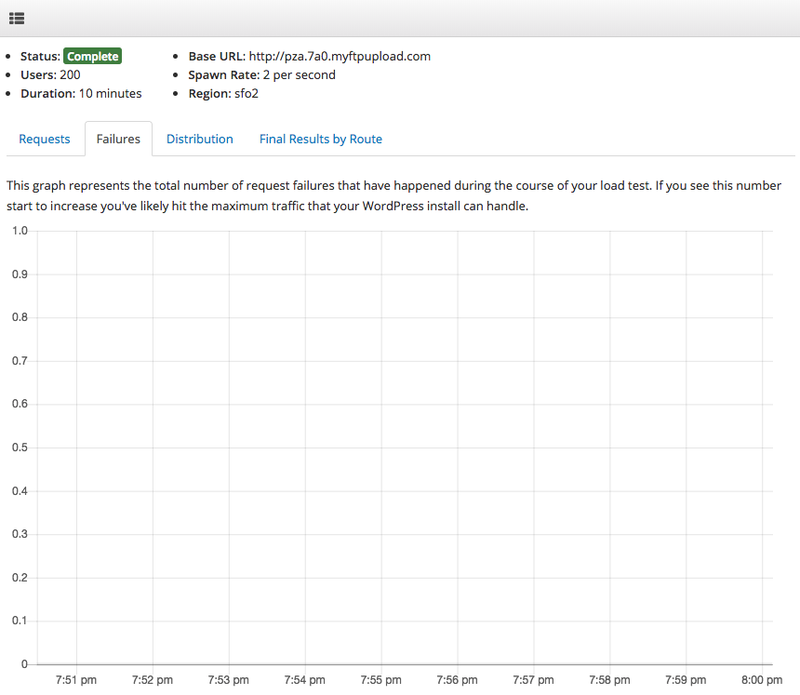 About 10 minutes into the test we see a HUGE spike in errors. After a short period of time the errors stop accumulating. I’m not sure what happened here, but I suspect that some sort of scaling event was triggered in GoDaddy’s infrastructure. After the scaling event completed they were able to continue serving traffic. We didn’t see any more errors for the rest of the test. 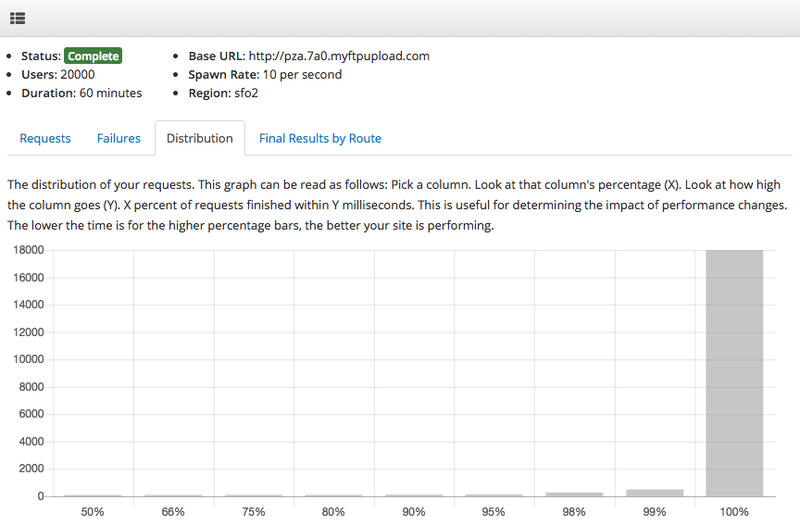 For the distribution graph of this load test I would argue that GoDaddy performed very well under some fairly intense load. 99% of requests were finished in 460ms. There is obviously an issue with that other 1%, but that was likely due to the weird error event that happened at around the 10 minute mark. Overall GoDaddy performed far better than I expected on the sustained traffic test. I personally haven’t used GoDaddy as a WordPress host in ages, but for this one metric (performance under load) I think they really did a great job. The traffic spike test is absolutely brutal but is definitely the kind of traffic you can expect if you had an article or site shared by a Twitter celebrity with a large following. The requests graph for this test is by far my favorite out of this entire article. It shows linear growth with no slowing down. For reasons highlighted later I killed this test at ~10 minute mark, but up until that point GoDaddy was a rocket ship. At the point I stopped the test we were running at 483 requests / second. The failure graph for this test is interesting as well. You can see that all was well until about 9 minutes in when errors increased sharply. I could have continued the load test but chose to stop it at this point due to the increased error rates. In hind sight I should have continued the test. Next time! The most impressive aspect of the traffic spike test was the distribution chart. 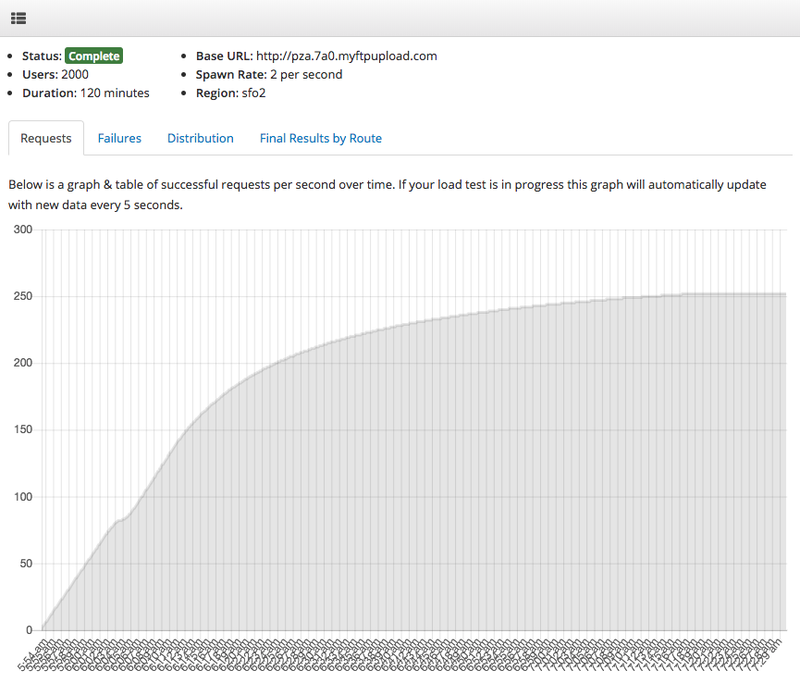 Even under some incredibly high load (for a WordPress site), GoDaddy was still returned 99% of requests in under 500ms. Great work team GoDaddy! 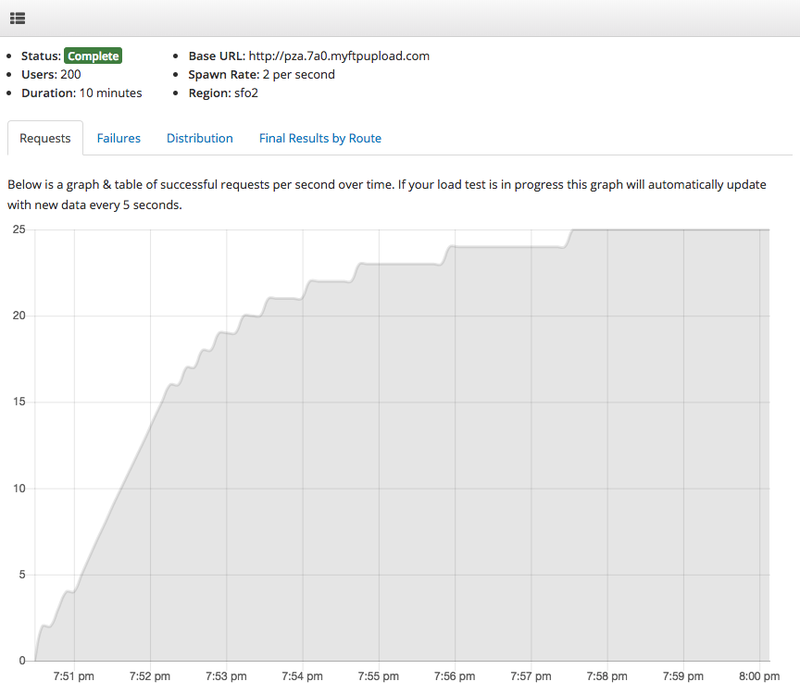 For the single metric of speed and responsiveness under heavy load I think that GoDaddy’s managed WordPress solution did a fantastic job of handling the load that the Kernl WordPress load testing tool was throwing at it. If you have a site with really high traffic, GoDaddy should be on your list of hosts to check out. Want to run load tests against your own WordPress sites? Sign up for Kernl now!